Welcome to the Spring edition of Mondo’s newsletter. We’ve so much to share with you about the life-changing work we are developing with local partners in Nepal, Tanzania and NE India. We are delighted to introduce our new logo to accompany the simplification of our name to “Mondo Foundation”. We are still up for the Challenge and this is reflected in our strapline “locally-led responses to global challenges”. The mountain motif hints at our main areas of operation and history but also our commitment to work in remote areas. We were lucky enough to work with brilliant a designer, Adam Baker, who provided generous part-pro bono assistance. Nine schools up in Nepal, four to go! The HELP team have worked tirelessly since the 2015 earthquakes and, as we pass the third anniversary of the devastation, we are proud to report that they have, working hand in hand with local villagers, completed 9 schools to earthquake-resilient standards. The majority of these schools are two-storey 10 classroom builds and through the generosity of our funders and strategic partners like the British Foreign Schools Society we have secured the remaining funding to complete or start on the build of 4 new schools in Bhotang, Bhotenamlang, Laangarche and Ichowk (the last in partnership with Caritas). Stephen says, “On the latest school build we had 60 villagers joining the professional building team in constructing their own school. This ‘sweat equity’ is such a precious element of our work and we now want to see how we can better support the creation of quality jobs, especially for students as they leave school. Every day, over a thousand people are migrating from Nepal to work overseas, often in appalling conditions. We want to help stem this exodus and invest in future leaders”. 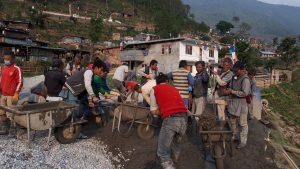 Next week, Simon Cowley (Chair) and Nitish Upadhyaya (Trustee) are travelling to Nepal to spend time with Jimmy Lama and review the school building work. Stephen will join them later in May and we have meetings with the British Ambassador, DFID and others in Nepal as we seek to develop our new vision for livelihoods and employment training in Nepal. Schools back in action in NE India! 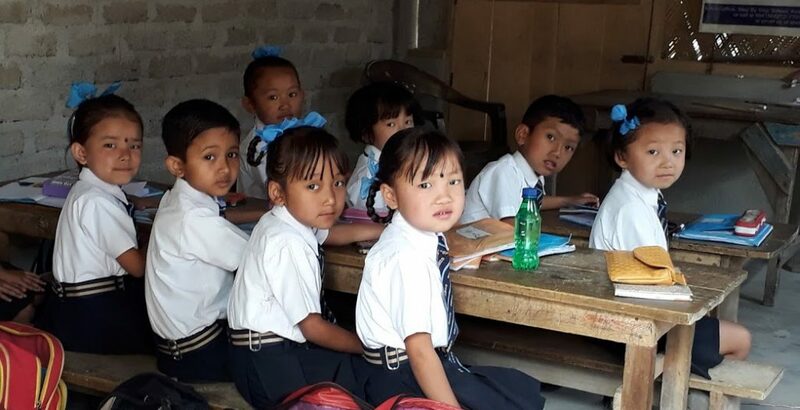 You’ll remember that a general strike in 2017 meant our Country Team was experiencing severe difficulties in supporting the 13 schools we fund in NE India. Thankfully the strike ended in December and none of the schools we support had to close. We provided emergency funding and last month Anna Brian visited the team and saw at first hand the work the schools are doing using our Self Evaluation framework. 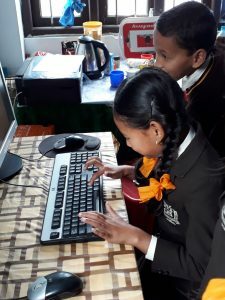 We currently have 2 volunteers working in the schools and later this year a highly experienced teacher will be working for 9 months in Kalimpong running sessions on Phonics and training teachers. Building schools is vital but so too is providing training for teachers and helping improve the quality of teaching and learning. Over the last few years we have been piloting the co-design of a unique Self-Evaluation Framework (called PIQUE – Programme for improving Quality Education) through which local schools identify their priorities for improvement and are given support and training to capture evidence of change and monitor quality improvements. Hirsh, one of our Trustees, has just written an update on how PIQUE is being received in our partner schools and next steps. We are lucky to have an experienced ex-teacher and OFSTED inspector who is currently working with us in Nepal and India alongside the teaching teams to help them to develop their thinking. We are still actively looking for other experienced teachers to volunteer to work with us! Excuse the pun but we can’t resist making the link with a group of 11 young apprentices people from the Leonardo Helicopter Company who are currently working at Bhotenamlang. What is so special about this trip is that their ‘AWASA’ apprenticeship programme has committed to raising £60,000 towards the re-building of this school. They have already raised £32k and have come to see our progress for themselves! Click here to see a short film of the students in the classroom sharing how a helicopter works! Inspiring students is one of the biggest roles for our volunteers – and maybe one day we’ll have a helicopter pilot saving lives from ones of the students in this class. Our thanks to the AWASA team for all their continuing efforts to complete the fundraising! We’ll have an update on our work in Tanzania in the next newsletter! If you’ve got any questions or thoughts on our work, we’d love to hear from you!